I´ve been saving some special yarn for December. The idea was to knit socks with them throughout the month. To make sure that I´d be able to knit with all of them, I allowed myself to cast on a new pair of socks each day, until all of my Christmas yarn was on the needles. On November 30 I had gathered all my special yarns, and took a photo of it (wearing last years Christmas socks). Due to unexpected events in our familiy, I wasn´t able to cast on any socks until December 2nd, and then it became therapy). Trying to take my mind off troubling thoughts I dyed up a couple of skeins that same weekend, and ended up with yet another Christmas yarn. Or, two actually, but I´m saving one for the Little Bobbins Christmas Eve Cast on! Today I was able to take a picture of my progress so far. So. I´ve got 5 pairs of socks on the needles. Working a little on one or more every day. It´s my knitting calendar if you will. I´m a bit short on Christmas themed project bags, so I´m keeping them all in the two bags I have. …and I love him for it! Showing of pictures of your dog is always a good way to start a blog post. So here is my boy Gustav this morning. For those of you that follow me (us) on instagram, you will know he has had an ear infection most of the summer. Well, it looks like it´s on the mend now! He still has a few days left on medicine (which he loves, because it´s wrapped in cheese…), and we are waiting for his test results to come back to see if he has any allergies. But he is doing fine and is his usual happy self. Isn´t he just beautiful? Now let´s talk about knitting! The last few days I´ve been knitting away on my main project of the week, the “My Shetland Adventure” shawl. I´m using a yarn that I have never knitted with before, called Transylvanian merino by Moeke Yarns. It´s a single ply yarn, with a rustic feel. And what can I say? I love it! It has that natural feeling, and my hands do get slick with what I guess is lanolin(? ), but it´s great! The stitch definition is quite crisp, and I´m really curious to see how this yarn will look and feel after a good wash. It doesn´t feel all that soft now, but if it softens after wash, I will probably buy a sweaters quantity of it and knit my self a nice, cushy sweater for fall/winter! So far I´m in love with the pattern. I love the construction of this shawl! I Scratched my head a bit when I was ready to start the chart, but I believe my state of bewilderment was caused by my chart reading shortcomings as far as shawls are concerned, and not a glitch in the pattern. But it looks fine, so I´ve decided that I´m doing a good job! Yay me! 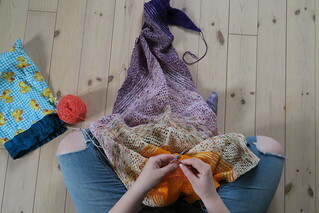 It´s hard to get a fantastic shot of my project since the needles are to short to stretch it out. And that gruesome, orange ribbon is also ruining it for me. But, there is a good reason why it´s there! I like to use ribbons instead of scrap yarn when I´m placing stitches on hold, simply because they are so much easier to transfer from ribbon to needles when it´s time to knit them! So if you have a grim ribbon that you know you´re not likely to use for anything, you should consider to make it your “piece of scrap yarn”. It won´t do much for your WIP photos, but you will make your life as a knitter a lot less frustrating. I will keep on knitting on this project for the rest of the day, but I don´t know how much knitting I will do tomorrow. I just got more undyed yarn in the mail, so tomorrow will probably be all about playing with colours! I can hardly wait!